Weather forecast from a Forsythia? Home » Spring » Weather forecast from a Forsythia? Many people use the yellow blooms of the forsythia to indicate spring has finally arrived and the soil temperatures have warmed. When the forsythia blooms they use it as an indicator to apply the first lawn fertilizer application of the year along with pre-emergence crabgrass control. A more scientific and accurate approach would be to measure the soil temperature and gauge if it has reached somewhere between 55 and 60 degrees at the 2 inch depth. Regardless, the ubiquitous presence of forsythia in bloom visually opens the floodgates of lawn activity every year. But what about the forsythia’s ability to forecast remaining winter weather like Punxsutawney Phil back in February? 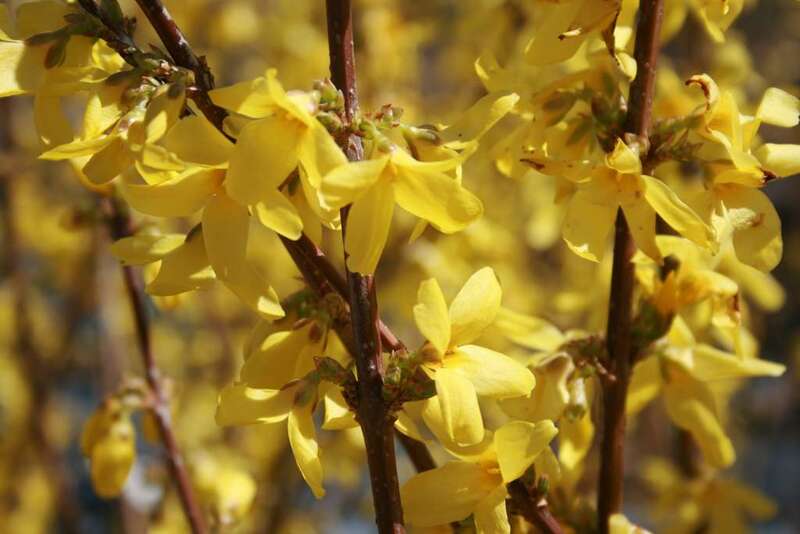 Do you believe the old weather tale which states that Forsythia can forecast late spring snowfall? The theory, tale or belief is that once the forsythia blooms there will be 3 more snows. They could be flurries in the air kind of snowfalls but snow none the less. Once the forsythia gets skilled enough, if ever, to predict the snowfall amounts, then the meteorologists will have reason for concern. Do you believe in the forsythia’s ability to forecast? “Weather” or not we welcome its cheerful blooms and the end of winter.